lake, a photo by bArfaNibAbA on Flickr. Situated at an altitude of 4,350 meters above sea level, Pangong Lake lies in the northeast of Leh. This famous blue blackish lake of Pangong is 5-6 km wide and over 144 km long with half of it running to the other side of the Indo-China border. The 160-km trip to Pangong Lake from Leh is an experience of its own. The first stop on the way is Thiksey village famous for its huge monasteries, which cover an entire mountain ridge. Beyond this remote village, there is nothing but the extreme mountain ranges for company. The second stop is the Changla Pass (17,350 ft.), which could test ones lungs, for the lack of oxygen. At Darbuk village near Tangste Valley stands a chain of war memorials with regimental insignias in commemoration of the soldiers who lost their lives during the Indo-China war of 1962. Some of the army bunkers and trenches are still in use. Villagers can be seen here along with their large herds of Pashmina sheep and long-tailed yaks. The placid Pangong Lake is not just a tourist’s paradise but a geologist’s domain too. Travelers can enjoy the solitude for a day or two, zoom their cameras to shoot the black-necked Siberian crane around the Mahe marshes which are the only breeding ground for these migratory birds. At times, they are seen swarming in the cool colorful water of the lake. The long and narrow lake lies in the neighborhood of the famous Chushul Mountains. The size of the lake is best inferred from the probable etymology of its name, Pangong, which means extensive concavity. The mirror-calm water is cold, clear, and extremely salty, holding sufficient quantity of lime to form a calcareous deposit, which cements the pebbles together in patches of concrete on its bank. It is believed that there is a large amount of minerals in the basin of the lake, which result from the melting of the snow. The water sparkles in distinct shades of blue, green, purple, and violet, being transparent to a good depth. With ease, one can pick pebbles from under the water, and if one is lucky enough, a fossil shell in the clay deposits may be a rewarding find. Regular flights go to Leh from Delhi. Once in Leh, one can hire a taxi to Pangong Lake. Otherwise, one can make arrangements with some travel agencies, which are ever ready to take one on a trip to the saltwater lake of Pangong Tso. 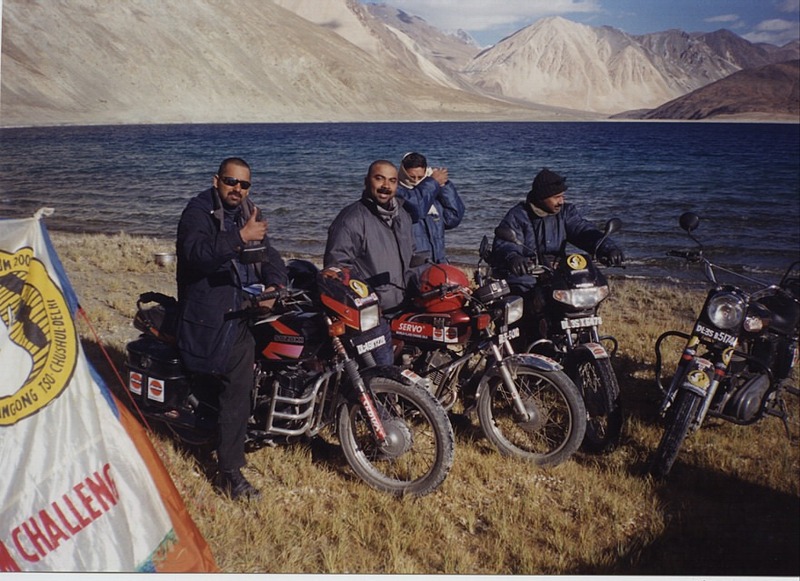 One can also take the motor route of Delhi-Manali-Jispa-Darcha-Sarchu-Leh-Khardungla-Pangong. Leh – Karu – Chang-la- Durbuk – Tangse- Luckung- Spangmik and return. This route takes the visitor past picturesque villages of Shey and Thikse, and turns off the Indus valley by the side-valley of Chemrey and Sakti. The Ladakh range is crossed by the Chang-la (18,000 feet / 5,475 m) which despite its great elevation is one of the easier passes, remaining open for much of the year even in winter, apart from periods of actual snowfall. Tangse, just beyond the foot of the pass, has an ancient temple. But the main attraction of this circuit is the Pangong Lake, situated at 14,000 feet (4,267 m). A long narrow basin of inland drainage, hardly six to seven kilometer at its widest point and over 130km long, it is bisected by the international border between India and China. Spangmik, the farthest point to which foreigners are permitted, is only some seven km along the southern shore from the head of the lake, but it affords spectacular views of the mountains of the Changchenmo range to the north, their reflections shimmering in the ever-changing blues and greens of the lake’s brackish waters. Above Spangmik are the glaciers and snowcapped peaks of the Pangong range. Spangmik and a scattering of other tiny villages along the lake’s southern shore are the summer homes of a scanty population of Chang-pa, the nomadic herds people of Tibet and south-east Ladakh. The Pangong Chnag-pa cultivate sparse crops of barley and peas in summer. It is in winter that they unfold their tents (rebo) and take their flocks of sheep and pashmina goats out to the distant pastures. Pangong Lake in Kashmir is the world’s highest brackish lake at 14,256 feet above sea level. A few years back the government decided to open it to tourists though the lake and its surrounding is under army surveillance. The tourism department intends to develop the infrastructure and facilitate the route leading to the lake. A place too easily arrived at is scarcely worth traveling to at all. Consider the ‘tired tourist’ who simply seeks solace in much talked about destinations, where he tends to relax and stroll the evenings away, buy a few souvenirs and sample the cuisine from the endless menu. And there’s the ‘tireless traveler’ the learning by living person who opts for a destination in order to explore and experience the unknown. 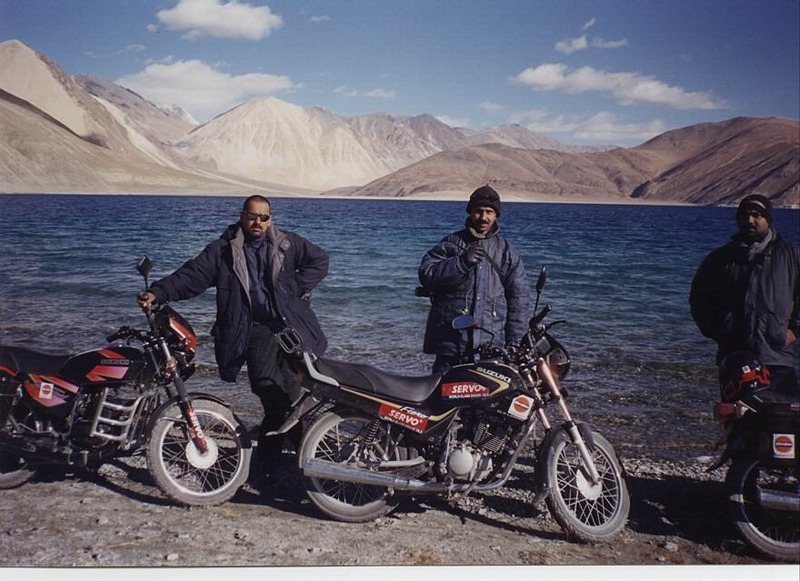 The 160 km trip to Pangong Lake from Leh is one such experience. It begins with Thiksey village famous for its huge monasteries covering an entire mountain ridge. Beyond this remote village there is nothing but the extreme mountain ridge. Beyond this remote village there is nothing but the extreme mountain ranges for company. The topography throughout the journey shoots up so abruptly that they throw off all calculations of distance – what looked to be a ten-minute crossing easily required an hour or more. At times, it appeared as if so many of nature’s forces were warning us away at the steep slopes and uneasy bends and not to forget the great chunks of ice appearing static and frozen in time. At Darbuk village near Tangste Valley stood a chain of war memorials with Regimental Insignias in commemoration of the soldiers who lost their lives during the Indo-Chinese war of 1962. Some of the army bunkers and trenches are still in use. Villagers can be seen here along with their large herds of Pashmina sheep and long tailed yaks. The placid Pangong Lake is not just a tourists paradise but a geologist’s domain too and if one is to brush up with political history, the place is a melting pot of confusion and for sure it in no fun for the army in the biting cold to take care of the strategic landscape. Travelers enjoy the solitude for a day or two, zoom their cameras to shoot the black necked Siberian crane around the Mahe marshes which are the only breeding ground for these migratory birds. At times they are seen swarming in the cool colourful water of the lake. If one has boating in mind, one is heading for disappointment. Very few boats are available and they belong to the army who may consider your request but won’t allow you to go beyond half a kilometer though one third of the 150 km lake belongs to India. The remaining 100 km stretch of water belongs to China. The lake was once divided between Ladakh and Tibet as early as 1684 under the Treaty of Tingmosgang signed between the king of Ladakh, Deldan Namgyal, and the Regent of Tibet. As of today it is shared by India and China.